In Surprised by Grace, Archbishop Emeritus Daniel M. Buechlein offers a poignant and revealing look at how the stroke he suffered two years ago has changed his life and his journey of faith. In the opening pages of his latest book, Archbishop Emeritus Daniel M. Buechlein offers a poignant and revealing look at how the stroke he suffered two years ago has changed his life and his journey of faith. He starts by describing the physical challenges he faced when he realized he was having a stroke in the early morning hours of March 19, 2011—and how he called 911 on that feast day of St. Joseph. 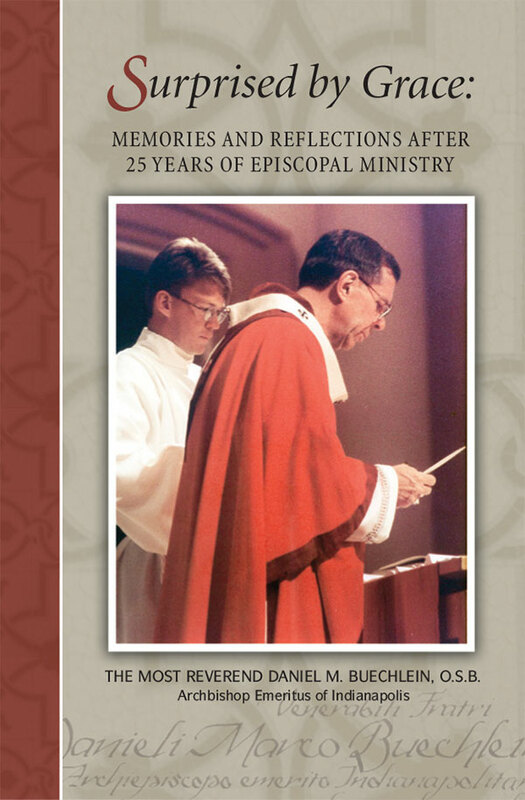 “Once I knew the paramedics were on their way, I had to figure out how to unlock the front door so they could get in,” he writes in Surprised by Grace: Memories and Reflections After 25 Years of Episcopal Ministry. The struggle was just beginning. In a first chapter titled “Aloneness,’ the archbishop emeritus writes, “Since the stroke, I have had to face the fact that I will never be able to live on my own again. My emotions, and my pride, strongly reject this humiliating truth about myself. I know that I have to fight against this temptation to see myself as ‘damaged goods for life.’ In fact, that’s not the case at all. My mind is clear. My body is healing. And I’m learning to deal with my emotions. In those opening revelations, the archbishop emeritus offers a powerful reminder of how a person’s mind and spirit can still reach for hope and holiness even as the body struggles—and the quiet strength and courage it takes to seek those goals under challenging circumstances. The book touches briefly on some of the highlights during his tenure—expanding the services of Catholic Charities to serve nearly 180,000 people a year in central and southern Indiana, raising $300 million to pay for building projects and ministry needs across the archdiocese, and having a Catholic school system in which 26 schools earned Blue Ribbon recognition for excellence from the U.S. Department of Education—more than any diocese in the country. Yet, at its heart, the book captures the journey of faith of a man of faith. The quiet monk who grew up in southern Indiana has walked a path of faith that has led him to personal encounters with the late Blessed John Paul II, Pope Benedict XVI and Blessed Teresa of Calcutta. He writes about his meetings with those spiritual leaders and the influences that their lives and their thoughts on faith have had on him. At the same time, he writes glowingly of the influence of his parents, and even the influence of a then-sixth-grade boy named Bryan Rush who wrote to him after the archbishop emeritus was diagnosed with cancer in 2008. The book also delivers a reminder that the burdens of carrying a cross can be lifted at times through the strength that other people provide in small ways. The archbishop emeritus recalls an unexpected visit he received in 2012 when he was in the infirmary of Saint Meinrad Archabbey in St. Meinrad where he now lives. The visit was from a group of young men and women from Indianapolis on a retreat at the monastery. The group stopped by to thank him for his years of effort to support young people in their faith. That visit touched the archbishop emeritus. In a different way, the example of Mary, Christ’s mother, has touched him throughout his life and even more so now. At the end of his book, the archbishop emeritus shares the inspiration for its title, and his life as a bishop. “When I first received the call to be a bishop, I was surprised by grace,” he notes. “That same grace [the love of Christ] has guided me, and sustained me during the past 25 years in personal and ecclesial crises, in moments of deep sorrow and in times of great joy.